I feel like Spring is finally on its way and I'm very, very, very happy about it. I'm totally over the cold weather now and can't wait for the sun to be shining and lighter evenings. I've been visiting family back in the Lake District this week and we've had some really lovely weather so I decided to make the most of it and get some outfit shots for my blog. I've had such a hard time getting decent shots over these past few months because of the weather so I was very grateful for a warm day with very little wind - the perfect combination for outdoor fashion photography!! I dragged my mum out to take my photos and we actually had such a laugh and found some really cute countryside backdrops!! I often forget what a beautiful part of the country I'm from!! Today I want to share this amazing striped jumpsuit I was recently sent from Charlotte Crosby's In The Style collection. It was love at first sight when I spotted it on their new in section and I love it just as much in person. I'm a big fan of jumpsuits - they're so easy to throw on for an instant stylish look which is perfect when you want to look like you've made an effort without all the actual effort of putting a stylish looking outfit together. I'm also a big fan of jumpsuits with a loose fit leg as I find them much more flattering than those with a tapered or fitted leg so this one is right up my street. However, the thing that really grabbed my attention about this jumpsuit is the beautiful colours. I love the mix of baby blue, black, cream and burnt Orange - it really is a stunning combination. It has a very seventies vibe about it in my opinion, especially with the vertical stripes! I feel like there's a lot of this style on the high street at the moment so it's clearly going to be a big trend this S/S season and I can see why as I think it's a really chic and stylish look. Plus, vertical stripes are really flattering which is always bonus! I just know I'll get so much wear out of it over the next few months. 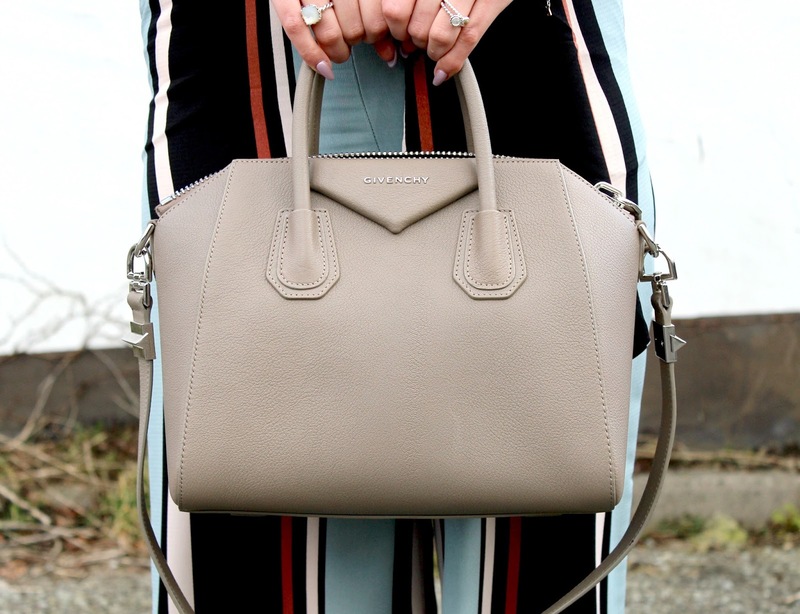 I paired the jumpsuit with my brand new bag, the small Givenchy Antigona. This thing is literally my pride and job - I'm obsessed with it. Seriously, I could just stare at it all day - it's too beautiful. I'm also so happy with the colour I decided on as it goes with SO many different outfits - it's the perfect neutral shade. I just love how chic it looks too, it really is the most perfect finishing touch and makes any outfit look 10x more stylish. It may be an expensive bag but I'll certainly get my use out of it. I'm also wearing my new Miss Pap Carmen aviator sunglasses which I absolutely love and they're such a steal at only £5 plus 10% off with the code KAYLEIGHJ10. Yay!! I love the aviator style so can see myself getting a lot of wear out of these as they'll go with any outfit. I hope you guys like this look! If you love this jumpsuit as much as I do, you can get it here for £37.99 and also get 10% off with my code KAYLEIGH10. I'd say it's a wardrobe essential!! Are you a fan of jumpsuits?! Loving your outfit and handbag, such a perfect Spring look! I love the baby blue in the jump suit! That is so cute!!! I love love love it!! Love the weist detailing and cutout! I'm so happy that Spring is finally around the corner. Striped jumpsuit looks beautiful on you. I like the cut out details.